“Beauty surrounds us,” wrote the Sufi poet Rumi, “but usually we need to be walking in a garden to know it.” Although the Napa Valley is known for its rolling acres of vineyards, it also has pockets of pastoral beauty – from private gardens hidden behind gates to larger landscapes at wineries to kitchen gardens at restaurants and hotels that are open to the public. 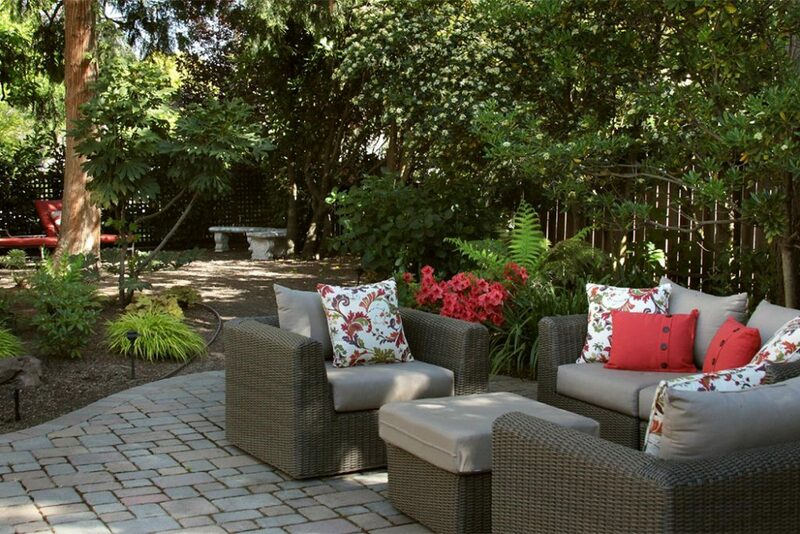 If you’re a garden-lover, here are a few to put on your list. 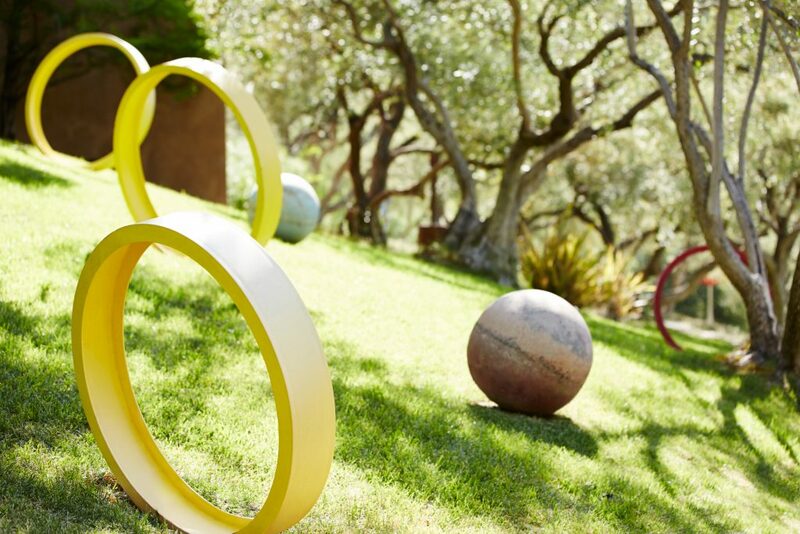 Auberge du Soleil – With nearly 110 works by 65 California sculptors, this hotel’s open-air gallery showcases figurative and abstract sculpture in bronze, steel, ceramic, stone and wood, with terraced rock walls created by hand in the Mediterranean tradition. 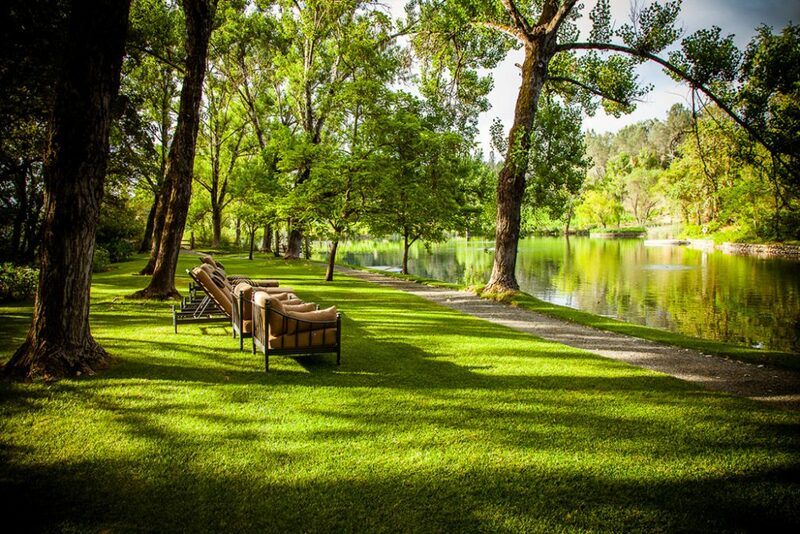 The works are placed throughout the 33-acre grounds, where meandering paths, dappled sunlight, a flowing stream, and ancient olive trees make a beautiful marriage of art and nature. 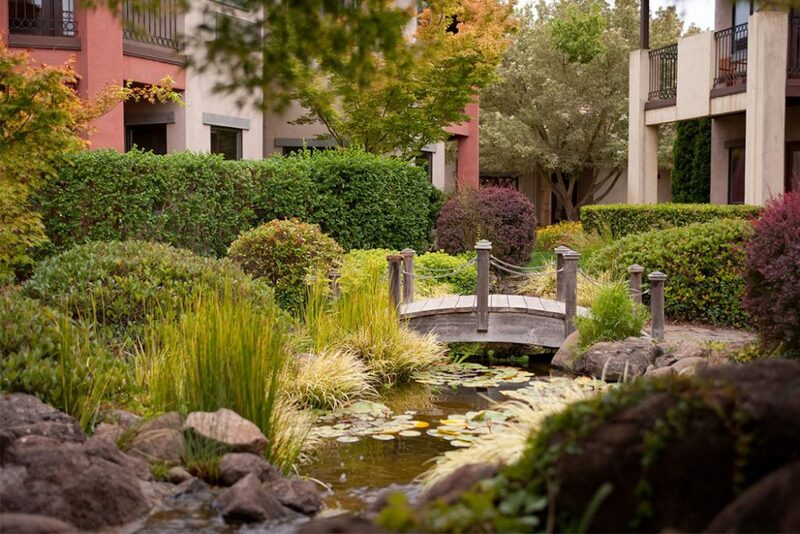 Guests of the hotel can stroll through the gardens at any time. Raymond Vineyards – Leave it to Raymond, known for its sense of drama, to feature an “extraordinary Theater of Nature Organic and Biodynamic garden.” As the largest educational exhibit on Biodynamic farming in the Napa Valley, it showcases how all the “actors” play a crucial part in crafting premium wine, from the soil to the vineyardis to larger forces such as the lunar cycle. Like a performance, the Theater of Nature is divided into five acts, with each act devoted to a particular component of nature. 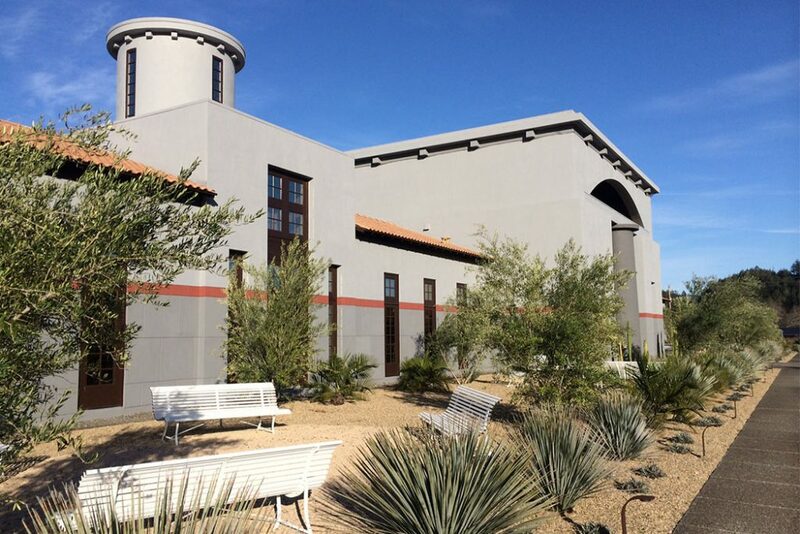 Open to the public daily from 10 am to 4 pm. 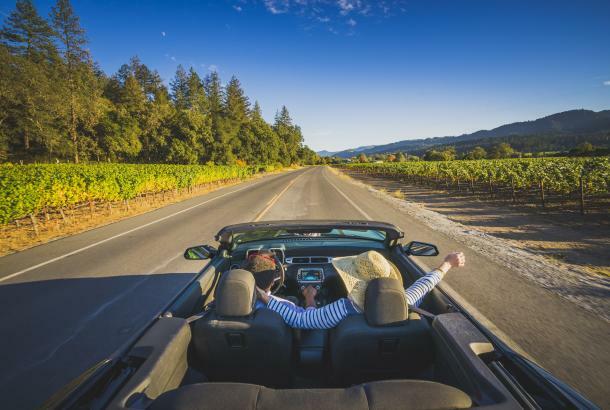 Sinegal Estate Winery – This new luxury tasting complex is set on a 30-acre property whose dynamic layout creates an idyllic wine-country experience. The land includes a 19th-century Victorian home, a two-acre lake, olive orchards, hillside vistas, gardens, and a classic poolside cabana. 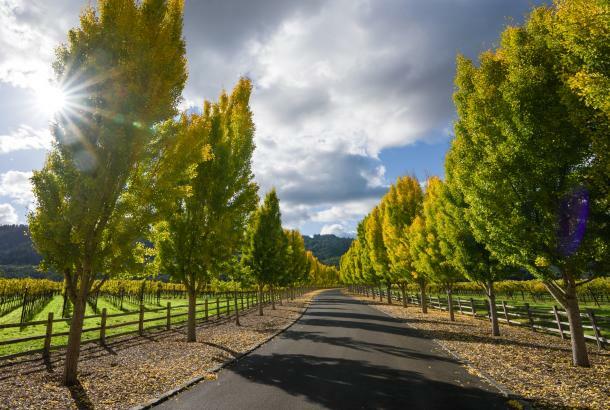 The winery was designed by Signum Architecture of St. Helena, whose previous work includes HALL Winery, CADE, and BRAND Napa Valley, and the gardens were designed and planted by Master Gardener Lila Jaeger and Jane Wolf, both former owners of the property. Tours and tastings are available by appointment only. 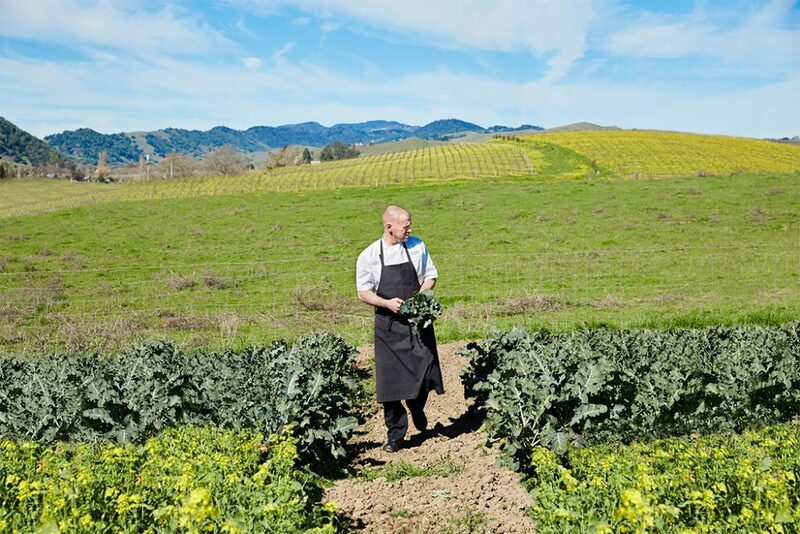 The Carneros Inn – Executive Chef Aaron Meneghelli and the inn’s Culinary Gardener, Marley Dawson, manage this quarter-acre farm that provides year-round produce for all onsite restaurants, including tomatoes, cauliflower, pomegranates, micro-greens, broccoli, squashes, and more. Open to hotel guests, the garden is replanted seasonally and allows kitchen staff to pick the freshest ingredients right on the grounds. FARM Restaurant also offers a “Gather and Garnish” program that allows hotel guests to forage ingredients from the farm and fruit trees in the area to create their own perfect cocktail. 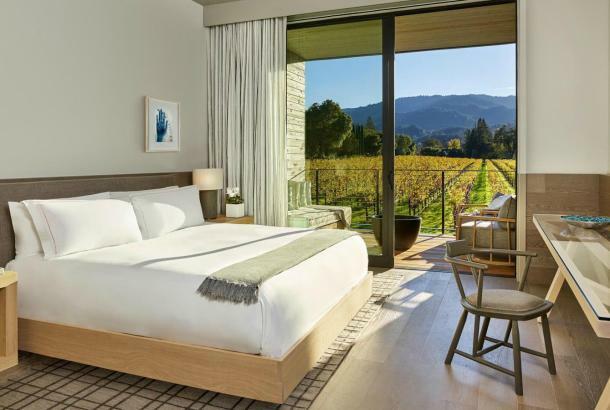 Vintage Inn, Villagio Inn & Spa, and V Marketplace – If you’re strolling around Yountville, take a short detour to wander through this hotel and shopping complex with its meandering cobblestone paths, lush picnic gardens, beautiful water features, and nearby vineyards. 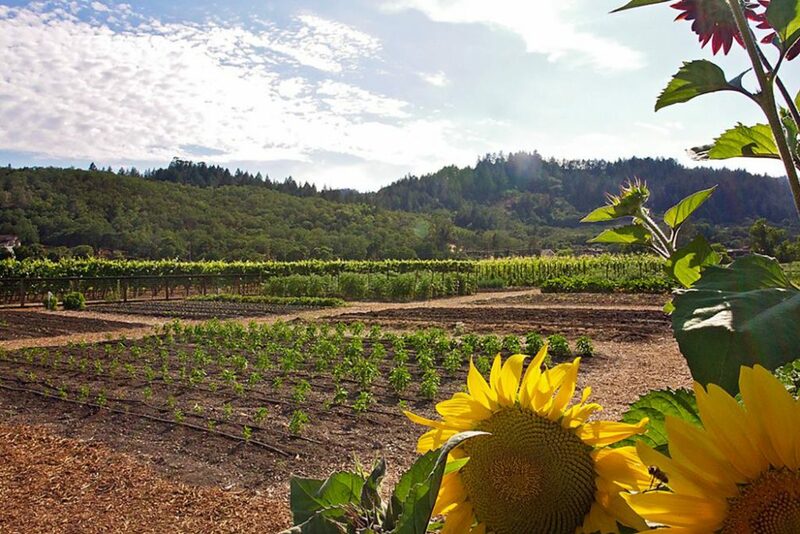 Peju Province Winery – This winery provides a garden oasis in the heart of Rutherford. Tony Peju designed the gardens himself and both he and Herta Peju oversee their care. Guests are welcomed to the property with an allée of arching sycamore trees that line the driveway. As you wander the property, you’ll find a hidden koi pond surrounded by trees, impeccable lawns, meandering footpaths, and seasonal flowers. 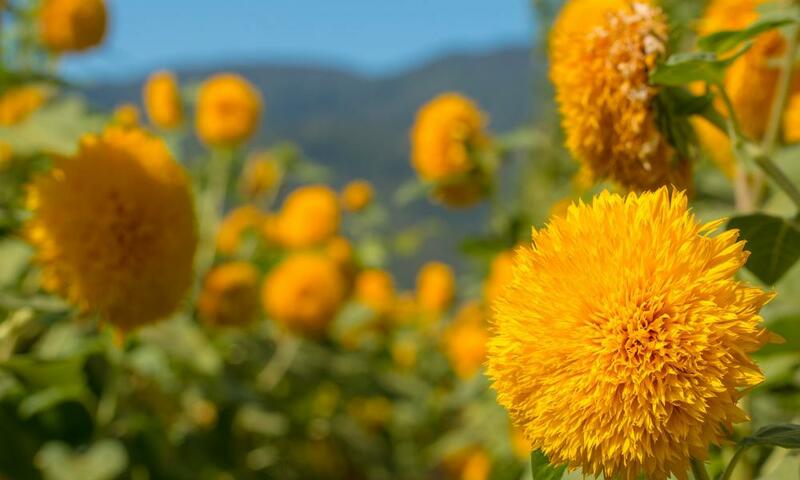 During the summer, their award-winning Peju “Teddy Bear” sunflowers are in full bloom. The gardens are open to the public from 10 am to 6 pm daily. 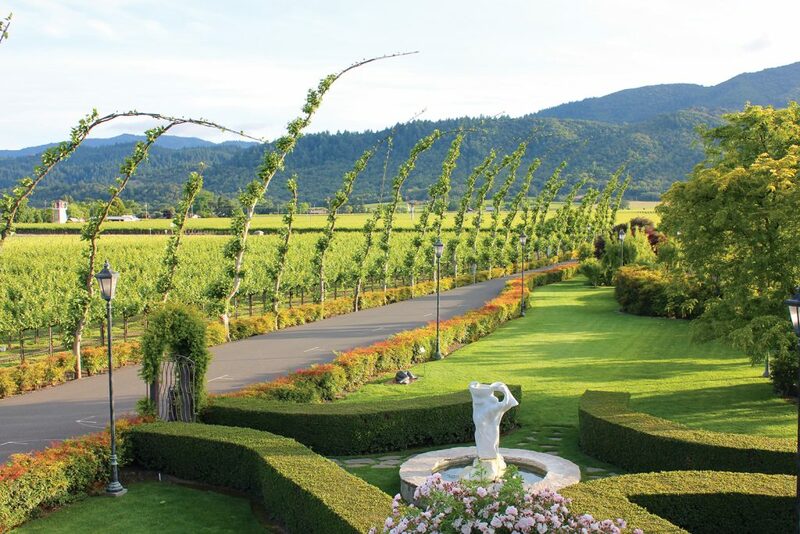 Charles Krug Winery – Just north of the town of St. Helena, Charles Krug’s three-acre estate garden is not only beautiful, but it serves as the Culinary Institute of America’s kitchen garden for future chefs to use in their training for farm-to-table cooking. 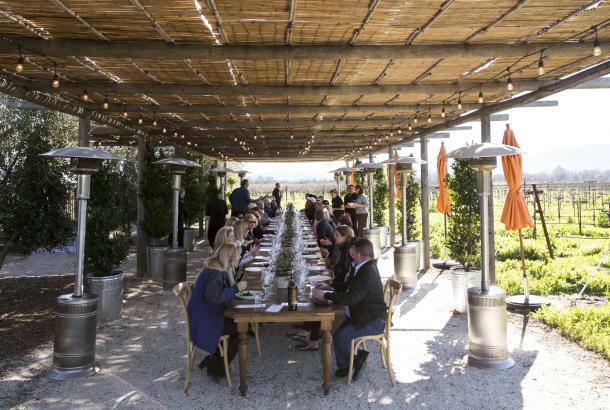 The winery also harvests its vegetables to serve in its Cucina di Rosa, a tribute to the family’s matriarch, Rosa Mondavi, who tended a large garden on the property years ago. Open to the public. The Inn on Randolph – Meticulously landscaped gardens occupy almost a full acre surrounding this historic inn and surrounding cottages. 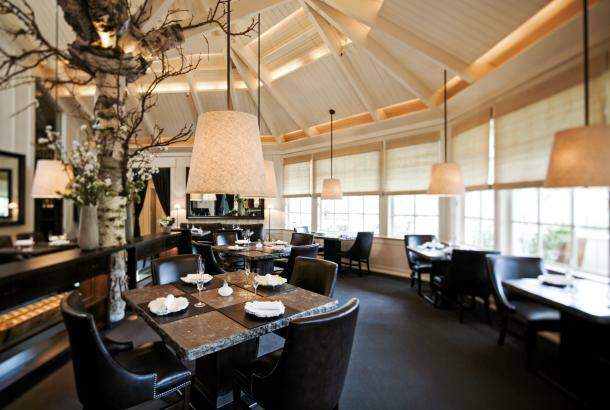 They’re designed around hide-away spaces, where every turn reveals a private sitting area, a fountain, or an herb garden used daily by the Inn’s chefs. Camellia trees in every color, a breathtaking tulip magnolia, and Meyer lemon trees are some of the guests’ favorites. 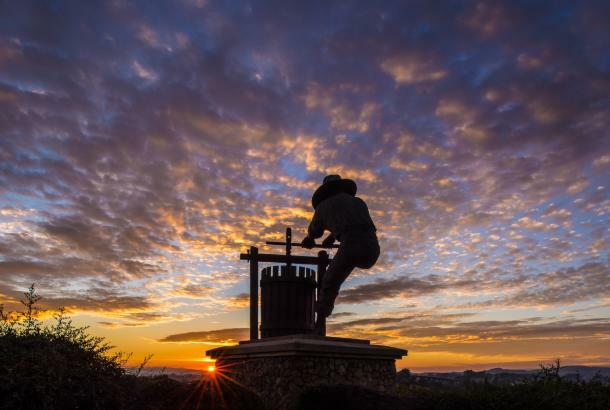 Clos Pegase Winery – This landmark estate, with its Michael Graves-designed winery, now has a Heritage Garden – a collection of rare, drought-tolerant plants and trees, including 19 wine palms. Rare in California landscapes, yet perfectly adapted to the state’s wine regions, this tree reigns with a grandeur like no other palm. The garden also has many species of agave, cactus, and yucca. Plants in the collection act as pollinator resources, their flowers attracting foraging bees and hummingbirds. 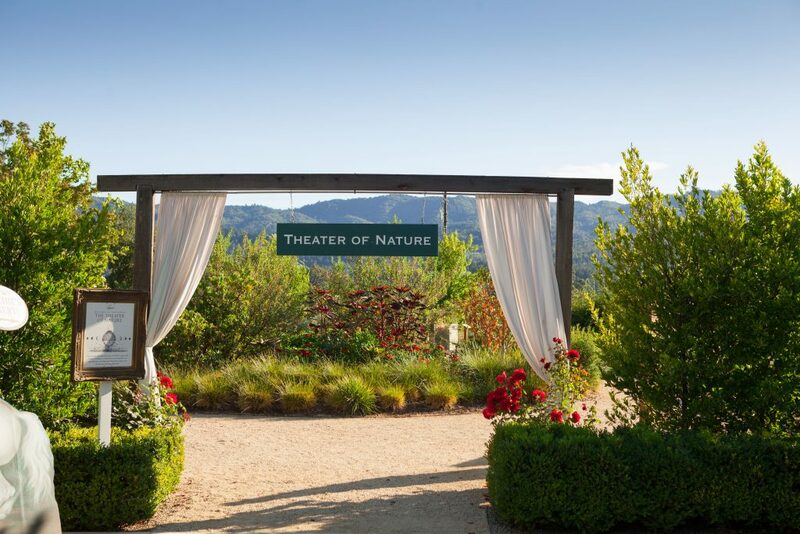 The winery’s decision to replace the winery’s expansive lawns with rare, drought-tolerant species from wine regions around the world shows its commitment to botanical diversity, water conservation, and responsible landscape design as living art. Open to the public.